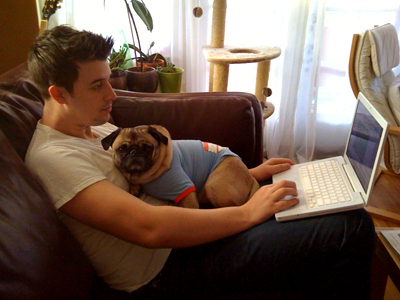 This is a picture from a couple years ago demonstrating how Stewie makes it hard to get work done. I swear as soon as you sit down in our house an alert goes out that there is a warm lap available. This was taken last week. Oscar is good at it too. You have the best pets! There's cute owl design for your desktop! Awww how cute is that! These photos are great! 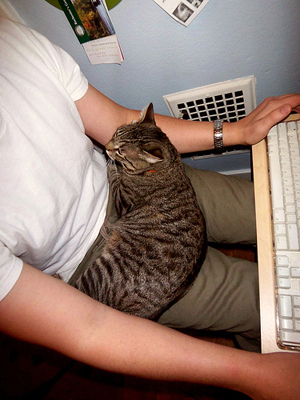 I have a cat and he is a lap cat and is always soooo jealous when I sit in my chair with my laptop. He sits and glares or he tries to do what your pug does! :) He is so cute! Michelle - thanks! that is so cute!